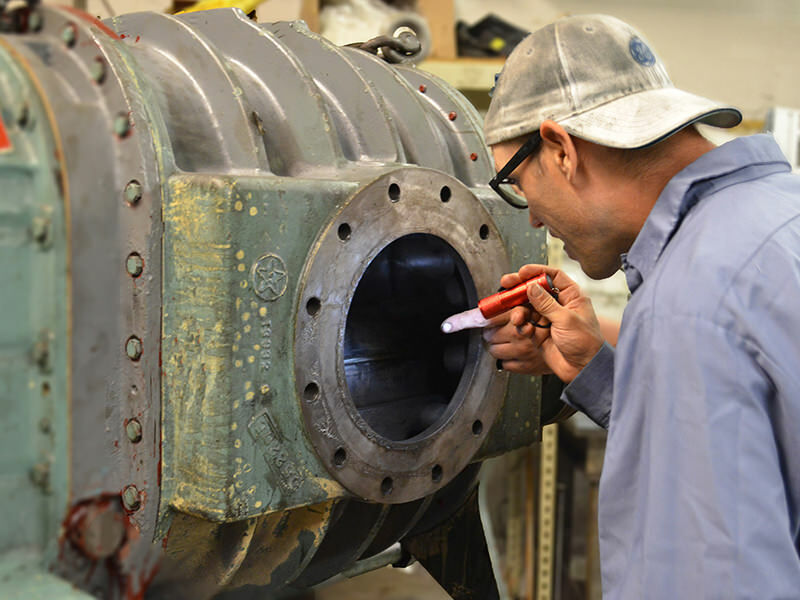 R&M has 100 years of combined blower repair experience. R&M specializes in positive displacement blowers. Unlike other companies, it is not one of many products we repair. We offer one full year warranty on material and workmanship on ever blower recondition. We only use factory OEM parts, so you know they are right for your blower. All blowers are run tested before shipment. Final clearance checks assure original performance so you don’t have to worry. We have full technical support over the phone or on site depending on your requirement. R&M’s courteous, factory trained and authorized technicians are dedicated to getting your system back up and running as quickly as possible. R&M Equipment provides comprehensive PD blower repair and service, auxiliary power equipment and noise reduction. Our highly-skilled, factory-trained technicians can perform testing, repair (in our shop or at your site) and installation of virtually any blower, auxiliary power equipment or noise reduction system. R&M is a Roots Blower Authorized Repair Center for up to 20” Roots positive displacement blowers. Our technicians are trained at the Roots Training Center, which has over 100 years of experience with all manufacturers of PD blowers. We offer 24-hour repair service and stock a large quantity of parts to guarantee a quick turn around. Add our Full Warranty, Parts Guarantee and competitive pricing, and there is no need to look elsewhere for all your blower repair requirements. 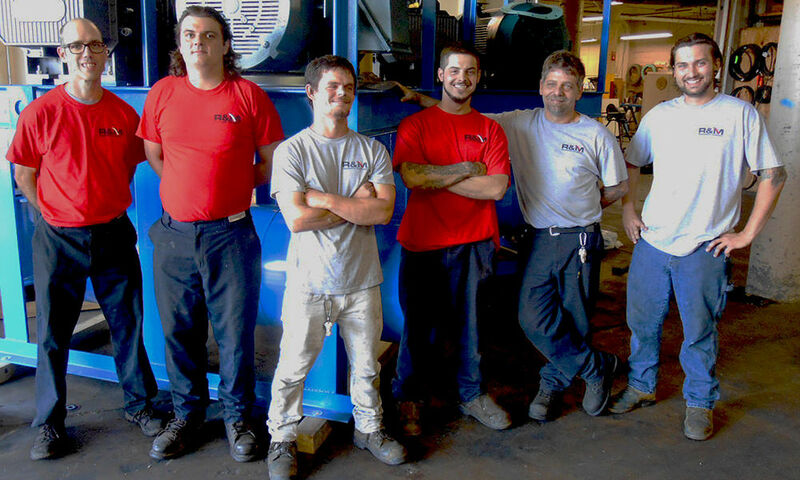 Truck Blowers: We are factory-trained to handle all of your blower repair needs. You can bring the blower to our shop on the truck, or send it to us loose, and we will inspect and diagnose your blower in a timely manner. Once the inspection is complete and you approve of the solution, the blower will be repaired quickly to minimize down-time. 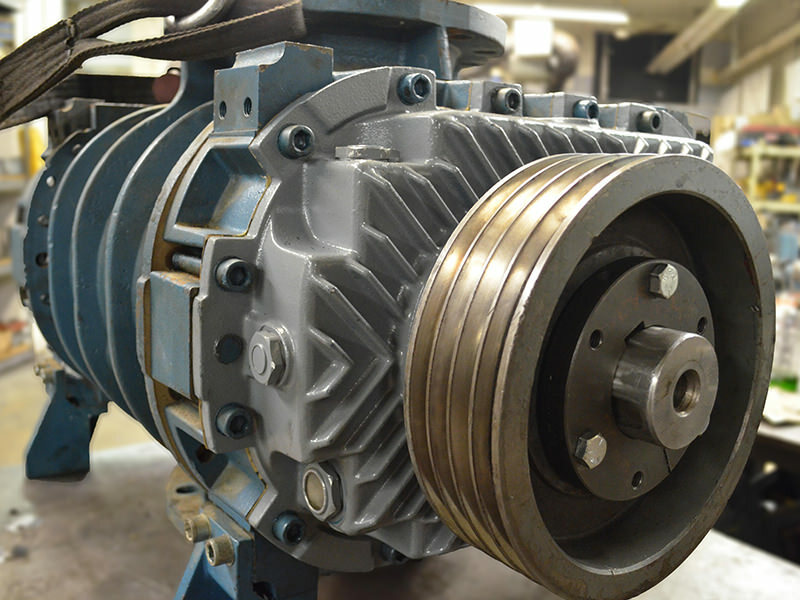 Centrifugal Blowers: R&M can repair equipment from all manufacturers of Centrifugal Blowers. With more than eight factory-trained technicians, R&M can have someone at your site within 24 hours to test and evaluate any problem or requirement you may have. Once the test is complete, R&M can determine a solution quickly and fix the problem in an efficient and cost-effective manner. All V-belt systems are laser aligned before leaving our facility. R&M Equipment is here to keep you up and running with an extensive inventory of blowers and parts. Our friendly service personnel will be happy to provide a quick response to your request. R&M stocks all of the Roots URAI & URAI-DSL blowers, from 2″ gear diameter to 7″ gear diameter. Noise: With state-of-the-art measuring equipment, R&M can determine the sound level of any noise producing machine. Once the test is completed, we have the knowledge and products to develop the proper solution to all noise-related problems. Vibration: R&M offers vibration testing on all blower packages shipping from our shop or running in the field. 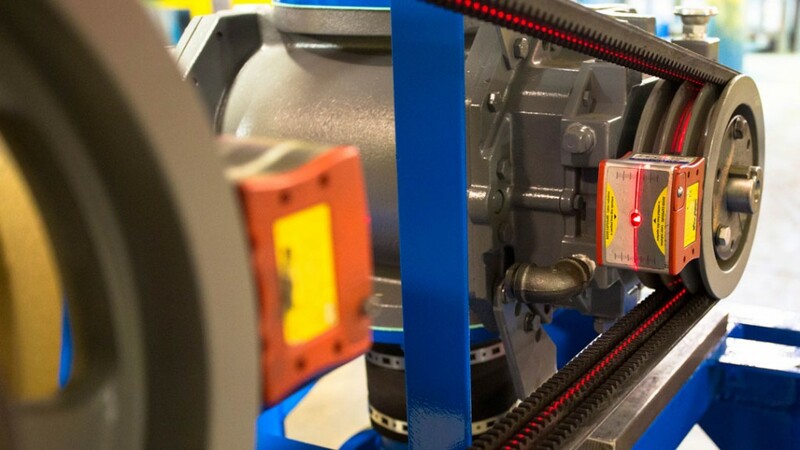 With years of experience in the packaging field, problems can be recognized and solutions offered for vibration problems with your blower packages. Blower Performance: Do you want to verify the performance of you blower? R&M has the knowledge and testing equipment to check blower performance on all packages manufactured in our shop. Blower System: Having problems with your blower package system? R&M has the ability to diagnose system problems and come up with a corrective action plan to prevent the problems from occurring in the future. Blower Packages: R&M technicians are qualified to perform complete installation of any blower package we build. Once the installation is complete, the package will be tested to insure system operation. Mobile Power: As a Muncie Power Products distributor, we have the capability of providing custom installation for our entire product line. We have years of experience in the installation of truck blowers, power take offs, hydraulic pumps and end dump wet line systems, to name a few. We pride ourselves in offering the highest quality installations at very competitive prices. Noise Control: We provide turnkey solutions to any noise problem. Testing, engineering, products selection and installation from one single source. Visually inspecting the internals of a 10” blower. Tight tolerances of direct drives calls for a knowledgeable R&M staff member to perform a laser alignment on site. We can repair any make and model of blower quickly and efficiently. A service technician checks tolerances on a blower repair. 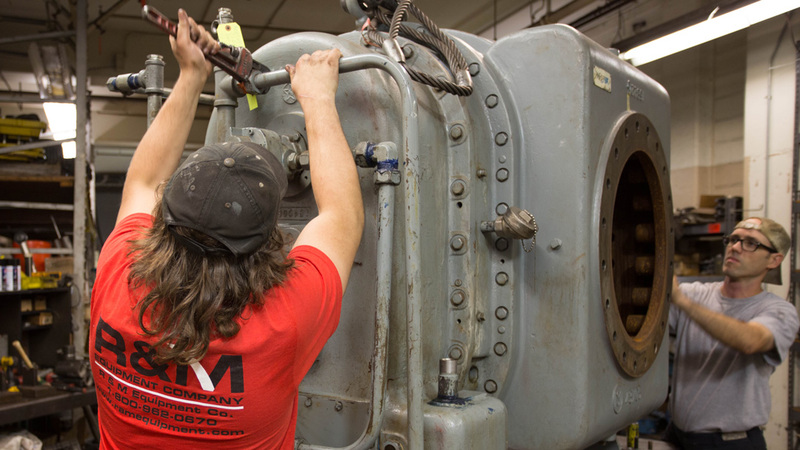 R&M technicians can repair or service any manufacturer’s blowers.